【Car Life Saver】 Enough power to boost vehicles (up to 2.0L Gas Engine) on the road! Works with vehicles( motorbikes and snowmobiles) up to 10 times with 400 amps of peak and heavy-duty clamps and cables. 【Smart Jumper Cable】 The high-quality cable more than 5 advanced safety technologies, it has over current protection, short circuit protection, overload protection, over-voltage protection, over-charge protection. With a harsh quality check, never worry about cracking or catching on fire. 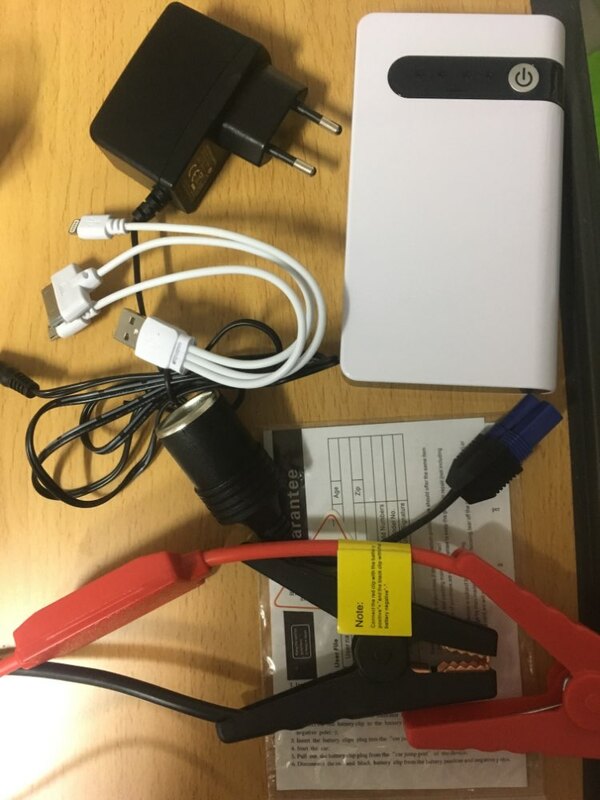 【Smart Charging Port】 Work also as power bank, jump starter is equipped with USB ports, the output power is up to 5V/2.1A. 【3 Modes Flashlight】 Main light has three modes: Illumination/Strobe/SOS signal. Nighttime travel, tourism, camping and forest groves are indispensable for outdoor adventure and emergency use. It is compact enough to store in a glove box or under a seat when not in use, ensuring that drivers anywhere have a power option to start their vehicle in a number of situations without the need to rely on towing services or the generosity of a jumpstart from a stranger. It’s versatile enough to jump start other vehicles, like motorcycles, snowmobiles, boats, and ATVs. 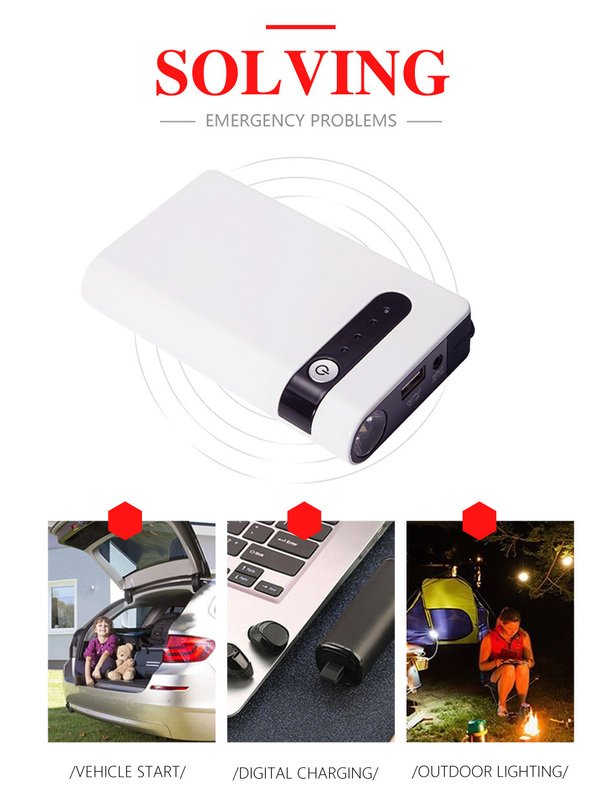 It has a 2 Amp USB output to rapidly charge any 5 Volt portable devices from smart phones to tablets to digital cameras, and many other devices, making it the ideal emergency battery pack for home, office, vehicle or the outdoors. The built-in high-intensity LED flashlight has SOS and Strobe functions for emergencies. High efficient jump starter for emergency vehicles starting/cranking. 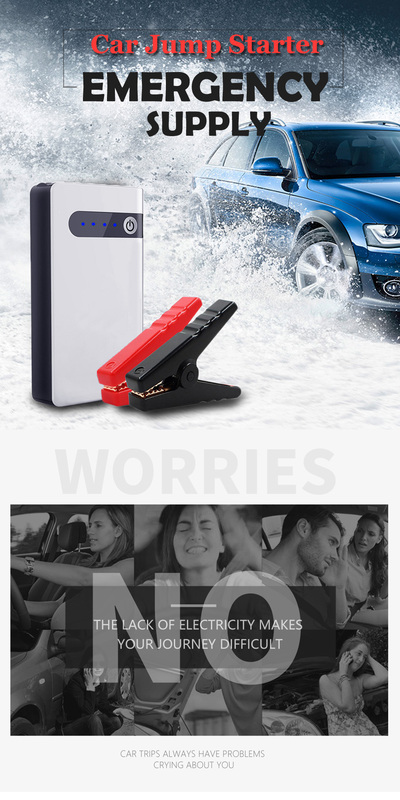 Multifunctional car emergency jump starter with high capacity battery to charge your electronic devices,like mobile phones, MP3, MP4, MP5,,digital cameras, so on. Advanced intelligent circuit protection keeps control on circuitry when charging your batteries for safety issues and protects the life of your battery. LED light for emergency warning and lighting can support 3 different lighting modes: torch, strobe and SOS mode. 1.Before you start the car,please make sure there are minimum 2x LED indicator light on, then connect the blue plug fully into the host socket,and confirm the cable indicator is off. 2.Connect the red clip to the positive (+) battery terminal, black clip to the negative (-) battery terminal. Q. How many times can it fully charge for mobilephone? Q. How long will this appliance take to charge my mobile phone full? Q. 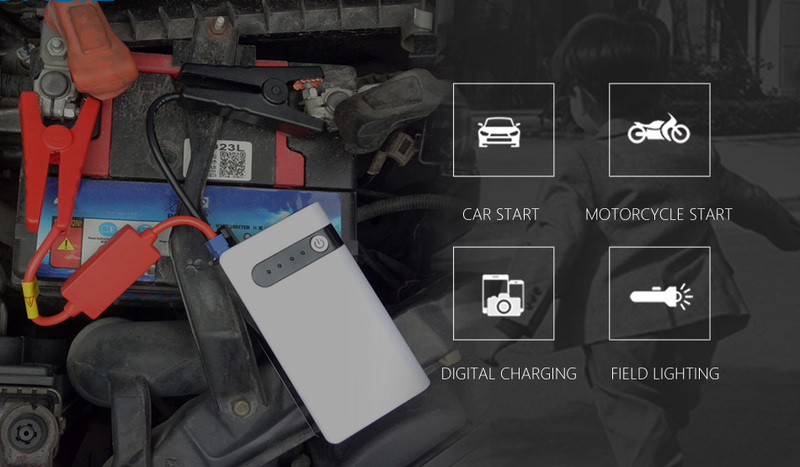 How many times can this appliance on a full charge start a vehicle? Q. How long will the power of the battery of this appliance remain? 1.Make sure to connect the blue plug into the Jump starter socket tightly. lf not, it can't Jump start the vehicle. 2. Do check whether the battery clamps are properly connected: check if the battery connector is rusted or dirty if the vehicle can not be started. Jump start again after cleaning Do not continue to jump start after 3 times if not successful. It will damage the product.Do check the vehicle for other reasons. 3. Do remove the product from the vehicle within 30s after the vehicle started. It's not safe to leave it on for more than 30 secs. 4. Do not connect the two clamps. It's not safe. 5. Do not decompose product. 60 Days Money Back Guarantee - 0% risk with 100% Money Back Guarantee. *Terms and Conditions Apply. Thanks for korean. 한국 전원코드에 맞춰 보내주셔서 감사합니다.